Seeing this image, it reminds me of my 7 year old nephew who is exactly like this. To him playing is video games/computer online games . He knows how to google for new online games and i knew about google when i was 22!! You get him a bat, he gets bored with it in a day. You get him a games dvd, he is the happiest kid on the block. My days of playing, was with my gang, a bunch of kids in the apartment we used to live. We used to run up and down the stairs, play around the building, fly kites, go cycling to the near by hill and we used to invent so many wired games ( i remember something called circus where we used to sell paper tickets to all other kids 🙂 ) . Where did the good old days of playing outside go !! 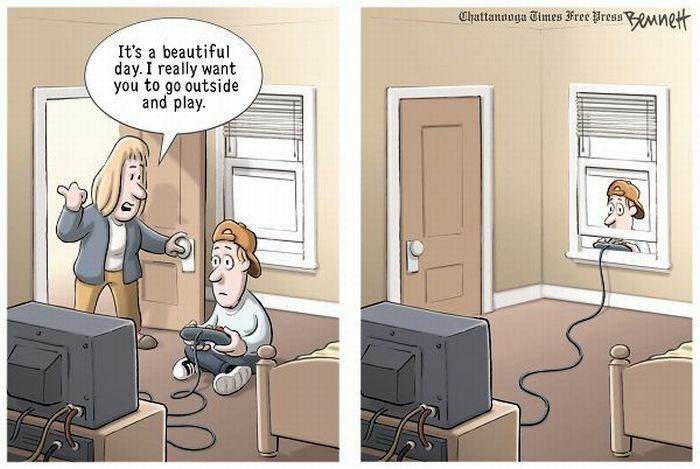 Nice one:)..true indeed..with all those nintendo’s and online games, the concept of outdoor games has gone a drastic change..